Dual Fuel Britannia Range Oven. Condition is Used. 120cm wide, ovens split 80cm/40cm 60cm deep 90cm high Duel Fuel, Gas Hob, One Multi Function Fan assisted oven, with integrated grill. One conventional oven, with integrated grill. Bottom storage draw Also with Wok Ring and Rotisserie In good condition, but needs a new seal for larger oven. The cooker is only 4 years old and in very good condition. A new cooker is only being bought as it will look better with the new cabinets. THERMADOR PROFESSIONAL 122 cm RANGE COOKER IN STAINLESS STEEL & BLACK..
THERMADOR PROFESSIONAL 122cm MULTIFUNCTION RANGE COOKER IN STAINLESS STEEL... This range is in excellent condition.,, it has been professionally cleaned to the highest standards.. FULL WORKING ORDER.. THIS ITEM COMES WITH 6 MONTHS PARTS WARRANTY. 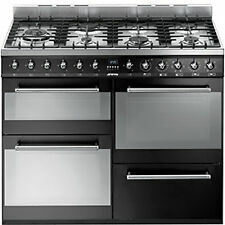 FULL NATURAL GAS HOB-- NATURAL GAS OVENS--- NATURAL GAS DELIVERY ENGLAND AND WALES £80. READY FOR COLLECTION OR DELIVERY.. DELIVERY WITHIN 2-5 DAYS. PLEASE NOTE... POSTCODES WITHIN 200 MILES FOR PRICES OUTSIDE THIS AREA PLEASE MESSAGE FIRST BEFORE PAYING.. PAYMENT..PAYPAL OR CASH ON DELIVERY.. THANK YOU..
Duel Range Cooker,Gas Hobs, electric Ovens And Grill Black With Stainless Steel. Condition is Used. Collection in person only. Bush Stainless Steel Duel Fuel Cooker . Condition is Used. 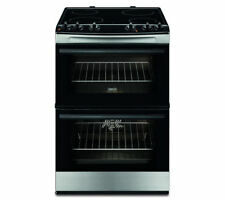 4 gas hobes Electric gril Electric oven with assisted fan . Electric lighter It comes with all racks and gril tray This cooker in fully working condition only the oven suddenly stopped working but the fan is still working Gril in fully working condition & hardly been used It is in good clean condition. It does not come with gas hose. 60cm Note : cash on collection only Reduced for quick sale I have limited time to listed on eBay so I have reduced. I need a space urgently. OUR SPLASHBACKS ARE MANUFACTURED ON-SITE IN OUR UK BASED FACTORY. TypeFreestanding dual fuel range cooker. Oven type- Main: electric. Oven type- Main: fan. Pan supportsCast iron. Oven cleaning- Main: catalytic. FuelDual fuel. - Grill pan. Viewing window- Main: double glazed. BE THE ENVY OF ALL YOUR FRIENDS WITH THIS STYLISH, BESPOKE SPLASHBACK. OUR FIRST EVER SALE IS HERE. PRICE SLASHED ON THIS ITEM! This cooker is top quality built and weights almost 200kg. Main large oven is seven functions fan assisted oven with grill and can be also used for traditional baking (top and base heat), grill on its own or fan assisted grilling, lower heat only for pastries and pizzas, defrost and slow cook functions.